The dental crown of a tooth is the portion that is covered by enamel. 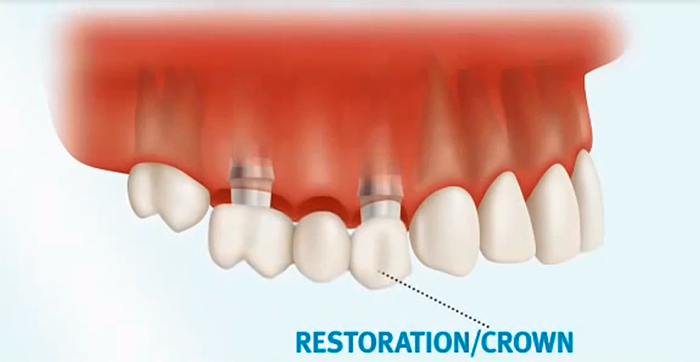 A restorative dental crown replaces this outer part to protect and strengthen the tooth. This protection becomes necessary when a tooth cracks, has its entire structure weakened by decay, or becomes weakened after a root canal. Dental Crowns can also cover dental implants or abutment (adjacent) teeth when fitting a bridge. Dental Crowns are also used to cover discolored or otherwise aesthetically displeasing teeth. Cosmetic dentistry does not use crowns as much as it once did, since crowns, though aesthetically pleasing, require more radical dental techniques. Dentists are opting for more conservative methods such as bleaching, bonding, or veneers to improve the aesthetic appearance of teeth. The dentist first removes the decayed portion of the tooth. The tooth is then prepared for a dental crown. It may be tapered on the outside edges to a peg, reinforced with a cast metal core, or rebuilt with both a cast metal core and a post. An impression of the prepared tooth and the teeth next to it is made. A retraction cord is placed around the tooth in order to get the impression medium under the gum where the crown will be fitted. The dental technician will create a new crown, using a cast made from this impression. The crown may be made of metal with a veneer of tooth-colored porcelain, or of porcelain or resin alone. The finished crown is then placed over the prepared tooth, adjusted, and cemented into place. When a tooth has had a root canal and the root has been filled, the tooth may not be strong. Post crowns are used in these cases. The tooth is leveled at the gum line and a prefabricated post is fitted into the root canal. This post can then receive the new crown and hold it in place. Dental Crowns can last 5-15 years or more, if they are well maintained. The predominant material choice for all ceramic crowns today is either Zirconia or aluminous materials. They provide a metal free aesthetic option with a number of benefits. By eliminating the need for the supportive metal core, an aesthetic all ceramic crown can be created with a reduced thickness of material. This makes them a more favorable treatment choice in areas with limited space. Additionally, the elimination of the metal core allows for light transmission through the porcelain for better optical, life like properties and a higher level of esthetics. All ceramic materials continue to evolve in strength and durability, but caution should still be exercised for areas of the mouth requiring heavy function. Continuing research is exploring the significant vulnerabilities of the porcelain systems in such areas. The cost of a dental crown depends on several factors, including the technical demands of the treatment, the training and expertise of the dentist, the training and expertise of the dental technologist, and the location of the dentist. Dental Crowns may range in price in the US from $1,000 to $3,500 and last between 10 and 15 years or longer, though results vary depending upon your unique considerations. In our clinic, crowns prices range from $280 to $450 been composite crowns (the cheapest ones) and full ceramic, between 500 – 690 USD (zirconia) the most expensive ones. The cost of a dental bridge varies according of number of teeth involved in the restoration. Each tooth to be replaced is considered as a dental crown. Dental Bridges are restorations that fill in a gap caused by missing teeth. They prevent the remaining teeth from shifting and provide a more stable surface for chewing. If the gap is not filled, the other teeth shift, affecting the patient’s bite (occlusion), which sometimes produces pain in the jaw joint. As the teeth move and become crooked, they also become more difficult to keep clean. The risk of tooth decay and gum disease increases, also increasing the likelihood that additional teeth will be lost. A bridge is inserted to prevent this risk. Bridges are appliances consisting of a metal framework and one or more artificial teeth (pontics) anchored to adjacent teeth. The abutment teeth carry the pressure when the patient chews food. Bridges can be removable or fixed (permanent). Removable bridges are attached to the abutment teeth by wires or precision attachments. Fixed bridges are attached to permanent crowns placed on abutment teeth. When the adjacent teeth are not strong enough to support a bridge, a two-implant bridge is required. This type of bridge takes longer for the permanent bridge to be fitted because of the necessity for the gums to heal. Implants are surgically placed into the patient’s bone and the gum closed. It takes several weeks for the bone to attach to the titanium implant. They are re-exposed and the bridge is made to fit. It is then cemented in place. Before a restoration is placed in the mouth, the dentist removes all traces of decay or damage and shapes the remaining tooth structure for the restoration. When bridges or crowns are necessary, the tooth or teeth that are to receive the crowns are shaped into posts or pegs. Temporary crowns and bridges are installed until the permanent restoration is delivered by the laboratory. Temporary dental crowns or bridges must stay in place until the permanent restorations have been fitted to the patient’s mouth. Dentists and dental assistants should educate the patient about ways to keep the temporary in place; e.g. avoid hard foods, gum and other sticky or chewy foods. Also, the patient should be reminded to call immediately if the temporary is loosened so that it can be re-cemented. Patients may also experience sensitivity to cold foods or drinks for a few weeks after a dental crown, bridge, or inlay is in place. Patients should be urged to maintain normal oral hygiene while they wear a temporary and after the crown or bridge is in place. Specialty brushes and floss threaders may be used to remove plaque and food from around dental crowns and bridges. The patient should see the dentist for an adjustment if there is any discomfort or irritation resulting from a restoration. Otherwise, the patient should see the dentist at least twice a year for an oral examination.